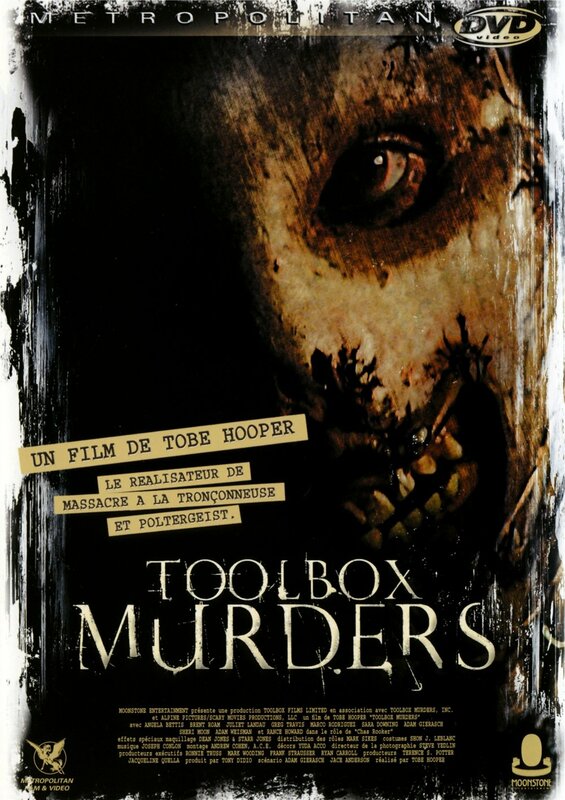 This updated version of Toolbox Murders is brought to us from horror icon Toby Hooper. This feature is bloody and raw but reeks of the early 2000's. From the colorless and drab setting to the emo actors. Namely, cult actress Angela Bettis. Her performance in May gained her slight success in the horror movie world. She is a great actress for forgettable roles. A young couple Nell (Bettis) and Steven (Brent Roam) move into a dilapidated old "historic" building in Los Angeles. Their neighbors turn out to be extreme caricatures of the usual people you would run into in LA. Slutty actresses, Scumbags, and self-absorbed jerks make up a good deal of the tenants. Early into the new couples stay, Nell finds human teeth in her wall. She is constantly harassed by the amount of commotion that goes on in the building and is certain that someone is murdering the tenants and in quite a brutal fashion. The title of the movie describes the how the killer murders his victims. We witness a number of murders with various tools like nail-guns, drills, hammers... etc. The movie has a conspiracy draped around it. The tenants seem to be almost covering up the murders and adding to a growing suspense as Nell is slowly driven crazy. This obsession with finding out what is going on drives her to discover some really interesting and neat plot devices. This leads me to the killer. A murderous psychopath named Coffin Baby that had apparently been living unnoticed in a townhouse located inside the historic apartment building!? His prefrerrd method of murdering is bludgeoning and murdering with tools. This character is not very original. However, how original can you get in the horror genre. The movie is executed well and it doesn't hurt that it is well made. Tobe Hooper just felt a bit disconnected from the project. Perhaps he wasn't proud of his work? Although it does have a ton of highlights and, to me, serves as a terrific remake despite the slight snags. Great movie for a Halloween marathon. Christian Bale stated in an interview that he tried hard to contact Tobe Hooper for the role of Steven Barrows and even personally recorded and sent a screen test of himself, but was never called back. He instead focused on scoring the role of Bruce Wayne/Batman in Batman Begins. Lucky McKee was originally set to play the part of the killer, but dropped out to work on his own horror film The Woods (2006). The tools in the toolbox belong to Tobe Hooper.